Although we anarchists recognize the need to build a revolutionary Organisation with tactical and ideological unity, whose task is to encourage the development of the workers’ consciousness of their revolutionary historic role of getting rid of capitalism and the institutions of inequality, we reject the use of the term “party” to refer to such an Organisation. We reject the use of this term for two reasons which derive from the word in question. The first is confusion with the bourgeois political parties; the second is the Marxist-Leninist concept of the party. It is these two ideas that we will be examining below. We run the risk not only of being confused with the bourgeois parties, but also with the Leninist ones. And something interesting emerges here: Leninism promotes the creation of a party that represents the interests of the working class. Some might draw the conclusion that anarchist ideas and the Leninist model have much in common, but that is something that we flatly reject, for two reasons. To begin with, as can be seen from the earlier part of this document, the concept of an Organisation of the most advanced elements (“vanguard”) was not something that was first expressed by Lenin. Decades before, Bakunin had understood that mass defence and resistance fronts alone (such as trade unions and international workers’ associations) were not sufficient to undertake a revolutionary struggle as they were lacking, amongst other things, that nucleus of the most conscious revolutionaries who could fight to ensure that the popular movements did not fall victim to reformist or openly bourgeois tendencies. The other main difference with the Leninist concept is even more important, as it concerns the aims of each tendency. The Leninist tendency wants the vanguard party to take control of the State once the revolution has been won, as its members are supposed to be the most conscious, the most intelligent, the best able to represent perfectly the interests of the proletariat. The function of the anarchist Political Organisation, instead, is not to conquer State power. Unlike the Leninists, we want the destruction of the State, as we know that political and military power in the hands of a minority in the name of the revolution is exactly what can damage the revolution most. The taking of political power, or rather the fact that a minority turns itself into a nucleus of professional politicians with the right to take decisions and impose these on the masses, signifies creating the seeds for bureaucratisation and counter-revolution. It lays the basis for a return to a society divided into a privileged minority and a huge oppressed and dominated majority. The goal of the anarchist Organisation is not political power but the building of proletarian popular power from the bottom up, in other words all the power based on the working people collectively through their assemblies and horizontal decision-making bodies. But Revolutionary Anarchism did not see its programme for homogeneous Organisation expressed only during the time of Bakunin. Apart from the Alliance of Socialist Democracy, other similar groups have at various times tried to emulate the role of the Alliance, groups such as the Dielo Trouda group, formed principally of Russian and Ukrainian anarchists who fought together with the Russian proletariat in the Russian Revolution, which was subsequently transformed by the Bolsheviks into a State-Party dictatorship. At the end of the 1920s, The Dielo Trouda group published a document which was very important for the international Libertarian Movement, opening a breach between Organised anarchism and the individualist interpretation of anarchism which repudiated the formation of an Organisation of the vanguard. The anti-Organisationalists consisted of those who did not want to make a commitment or be responsible as militants, those who repudiated that revolutionary discipline which, as Nestor Makhno pointed out, is essential for our tasks to be carried out successfully. 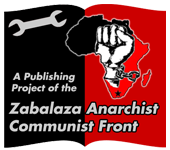 The Organisational Platform is a document published by the Dielo Trouda Group with the aim of bringing about a General Union of Anarchists, an Organisation of the revolutionary anarchist vanguard. It is a document that sets out the arguments regarding the need for an Organisational structure of this type. Another example of anarchism constituted in a Revolutionary Organisation is that of the Friends of Durruti in Spain during the 1930s, at the time of the Spanish Civil War. The Friends of Durruti were an anarcho-syndicalist group within the CNT who understood the need to form a conscious revolutionary leadership after the CNT began to commit historical errors such as joining the Republic’s bourgeois government. The Friends of Durruti, whose name commemorated the revolutionary anarchist Buenaventura Durruti who died in combat on 20th November 1936, realized that in the circumstances of the time is was urgently necessary to create a nucleus which would be able to indicate the correct positions for the Spanish proletariat so that it could go back to the strictly collectivist and anti-State positions which had been defended from day one of the Spanish Revolution by Durruti and Ascaso. We can summarize by saying that we anarchists of the Bakuninist line are advocates of a specific revolutionary Organisation that participates in the popular movements, seeking to insert our Libertarian Socialist programme in these movements and ensure that they proceed along anti-capitalist lines in order to abolish private ownership of the means of production and create horizontal and assemblyist popular power on the ruins of all that is called political power and the State. An Organisation of this type is what the militants of the “Alianza de los Comunistas Libertarios” want to build and we are working daily towards the social revolution and the emancipation of the world.